We’d love your help. 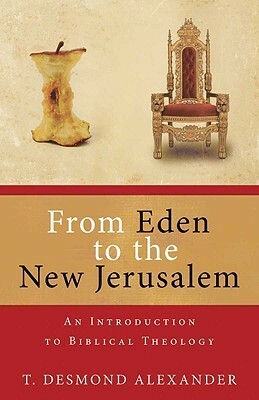 Let us know what’s wrong with this preview of From Eden to the New Jerusalem by T. Desmond Alexander. To ask other readers questions about From Eden to the New Jerusalem, please sign up. This is the best book of biblical theology I've read. It clearly and decisively argues it's main point - that the meta-story of the Bible is not adequately understood without a clear view of God's intentions in creation, His Kingship over creation, and the great hope of life with Him in the New Jerusalem. "As we move from Genesis to Revelation, a consistent and coherent pattern emerges, centred on the idea that God created this earth with the This is the best book of biblical theology I've read. It clearly and decisively argues it's main point - that the meta-story of the Bible is not adequately understood without a clear view of God's intentions in creation, His Kingship over creation, and the great hope of life with Him in the New Jerusalem. "As we move from Genesis to Revelation, a consistent and coherent pattern emerges, centred on the idea that God created this earth with the intention of constructing an arboreal temple-city. This unique metropolis, as God’s abode, will be inhabited by people who display the holy nature of God himself. While the opening chapters of Genesis allude briefly to God’s blueprint for the earth, his plans are almost immediately overturned – for Adam and Eve betray their Creator and give their allegiance to his enemy. Expelled from God’s presence, they forfeit their unique status as viceroys of the divine king. Against this tragic background, the rest of the biblical meta-story describes how God acts to reclaim the earth, and especially its people, from Satan’s control. ... Through Christ’s death, resurrection and ascension to the right hand of God the Father, Satan is defeated, preparing the way for the future establishment of God’s uncontested reign in the New Jerusalem." A great introduction to biblical theology. A bit less dense than some other recent work (Hamilton, "God's Glory..."), but a bit more demanding than others (Goldsworthy trilogy). I originally heard about this from various footnotes in Jim Hamilton's book, and was given a copy of it at the most recent SBC. Alexander covers quite a bit of ground under 200 pages, looking at various themes in biblical theology such as the role of the temple/church, sacrificial system, the new Jerusalem, and other new A great introduction to biblical theology. A bit less dense than some other recent work (Hamilton, "God's Glory..."), but a bit more demanding than others (Goldsworthy trilogy). I originally heard about this from various footnotes in Jim Hamilton's book, and was given a copy of it at the most recent SBC. The clearest overview of the Bible's grand storyline that I've read! Excellent book to help you see the major themes that run throughout the Bible from Genesis to Revelation. I especially enjoyed the last two chapters. Chapter 6 helped me understand better the book of Leviticus and chapter 7 gives an interesting contrast between two cities: Babylon and the New Jerusalem. Very convicting! A must read as an Introduction to Biblical Theology! Wonderful book highlighting the “meta-story” of the Bible. One of the best books I’ve read. Had excellent treatment of temple imagery in the OT and NT. Marred by erroneous views of the Spirit's indwelling and wrong inferences on capitalism. I'll be honest: I was already predisposed to like this book. Before I'd begun reading it, I had already learned about the author's unusual approach to biblical theology: start at the end, ask "How did we get here? ", and then go back to the beginning. Each chapter follows this pattern, highlighting a specific image/description of the New Heavens and New Earth in Revelation 21-22 (e.g. the New Jerusalem, the Tree of Life, the Lamb on the throne), explaining the meaning of the symbol, then going ba I'll be honest: I was already predisposed to like this book. Before I'd begun reading it, I had already learned about the author's unusual approach to biblical theology: start at the end, ask "How did we get here? ", and then go back to the beginning. Each chapter follows this pattern, highlighting a specific image/description of the New Heavens and New Earth in Revelation 21-22 (e.g. the New Jerusalem, the Tree of Life, the Lamb on the throne), explaining the meaning of the symbol, then going back and tracing that particular image/theme through the rest of the Bible from Genesis onward. It's a brilliant method of teaching, and I was hooked from the start. As Alexander argues, starting at the end reveals where the whole story of the Bible is heading, thus making it easier to discern the main themes and plot points of the overall story itself. Thankfully, Alexander's skill in tracing these themes matches the brilliance of his premise. He shows the staple quality of a great teacher: being able to condense big ideas into small, understandable summaries that don't cheapen the depth of the topics being discussed. I know I've said this about a good number of other short theological books, but it still amazes me how much information is packed into this little volume. This is partly due to Alexander's efficient use of footnotes, which take up less space on the page but are often just as interesting (if not more so) than the main text itself. When a book is this short and written at an introductory level, it is easy (and dangerous) to criticize it for leaving things out. But while Alexander handles the biblical themes highlighted in his book with exceptional skill, I'm still left surprised by some of the themes that get largely left out of his treatment of the biblical narrative. This wouldn't be a problem if the book presented itself as "a treatment of biblical themes that often get overlooked," or "a model of how biblical theology should be done." But the book advertises itself as "an introduction to biblical theology"; and in the introduction to the book Alexander indicates that his approach will highlight "the main elements of the meta-story" (pg. 10). With that in mind, I was disappointed to find that some of the foundational elements of the biblical story were left almost entirely untouched by the book. These include the nature of God (e.g. His attributes, the Trinity, the deity of Christ), the sinful nature of human beings (sin being described as rebellion against God and a submission to Satan, but little to no discussion of the condition of the human heart), and the major covenants between God and human beings (e.g. Adam, Noah, Abraham, Moses, David, New Covenant), all of which are touched on in the final chapters of Revelation as well. Rather than being secondary, these themes and plot points are absolutely crucial to understanding the biblical story. Again, I understand having a lack of space to write about everything one wants to; but when an entire chapter is devoted to unpacking the identity of the Devil and a good portion of the final chapter is spent denouncing Western capitalism while the above topics were left on the cutting room floor, one wonders about the author's priorities in choosing which topics comprise the Bible's main themes. A fascinating, really interesting look at reinterpreting the Biblical Meta-Narrative. Alexander presents a unified view of scripture, reaching from the Garden of Eden to the New Jerusalem. His perspective is that God's intention, was, from the beginning to create a Garden-Temple-City on Earth as a dwelling place and that all human-built Temples/Tabernacles were only echoes of the ultimate plan of God dwelling among us. Now, since the resurrection of Jesus and the establishment of the church, God A fascinating, really interesting look at reinterpreting the Biblical Meta-Narrative. Alexander presents a unified view of scripture, reaching from the Garden of Eden to the New Jerusalem. His perspective is that God's intention, was, from the beginning to create a Garden-Temple-City on Earth as a dwelling place and that all human-built Temples/Tabernacles were only echoes of the ultimate plan of God dwelling among us. Now, since the resurrection of Jesus and the establishment of the church, God's new temple (the church) is indeed growing, and one day the human temple will be completed at Jesus' return. A fascinating read, but it suffers from significant repetition that was unnecessary. The first few chapters work hard to establish the theme of the book and get it into your head. The remain chapters struggled to provide anything new - they were rehashes of commonly known theology, interpreted in the light of Alexander's thesis. This is a great book. Alexander starts with Revelation 21 and 22's teaching on the new heavens and earth and the temple-city that comes down from heaven. He shows that this is simply the culmination of what God planned on from the beginning---the institution of an Arboreal temple-city from which God reigns and lives with his people. So Alexander (a highly regarded Biblical Theology scholar) lays out what he calls the biblical meta-story by focusing on the bookends of Genesis 1 and 2 and Revelati This is a great book. Alexander starts with Revelation 21 and 22's teaching on the new heavens and earth and the temple-city that comes down from heaven. He shows that this is simply the culmination of what God planned on from the beginning---the institution of an Arboreal temple-city from which God reigns and lives with his people. So Alexander (a highly regarded Biblical Theology scholar) lays out what he calls the biblical meta-story by focusing on the bookends of Genesis 1 and 2 and Revelation 21 and 22. Alexander's notion of the earth's purpose as God's garden temple-city is a popular theme (laid out rigorously in Beale's The Temple and the Church's Mission, for example) and he pulls from many sources to establish this. Man was to extend the garden over all the earth. Adam and Eve's descendents would populate the earth as God's holy image bearers (in the ANE kings would place their images in all their domain to show that they owned it and were sovereign over it). He then points out that from the beginning the plan went astray. From then on, Alexander argues, we read of God's plan to bring about what he initially planned from the beginning. Alexander traces this theme of a temple-city with holy inhabitants from Abraham to the New Testament church. Along the way in this fascinating study (which he calls an introduction to thematic Biblical Theology) Alexander discussion such themes as God's sovereignty, Satan and the world's warfare against God, the slaughter of the lamb, redemption and sanctification, and assurance in living as a citizen of the kingdom as opposed to Babylon. This last theme is interesting. While Alexander certainly doesn't endorse any form of theonomy or theocracy, he does seem to say some things that might be at odds with the popular "dual citizens" view. Christians are called to flee Babylon, not participate as citizens of it (he shows this from Revelation and also pulls from Bauckham's commentary on Revelation on precisely this matter). Yes, we have to live in particular cities that are not the New Jerusalem, and we are "citizens" of it. But the sense the Bible understands "citizens of the city" wouldn't seem to apply. So, while it is true that we are "citizens" of our respective countries it is uninteresting as a theological point given how the Revelation is using this term. Call the uninteresting sense "citizen 1" and the Revelation sense "citizen 2." This means that we Christians are dual citizens 1 but not dual citizens 2. The latter invokes more Van Tillian worldview antithesis themes. In this illuminating study Alexander notes that John's vision in Revelation of a temple wasn't some esoteric vaporous abstraction but is rooted in the Old Testament, thus serving to unite the testaments into a coherent storyline. Alexander also touches on issues not the main subject of his book. For example, though the book deals with eschatology broadly, it does not look at the millennial position. But Alexander takes views of some of the "golden age" passages not in accord with postmillennialism. He places them in the new heavens and earth. He also intimates that the next time Jesus returns bodily will be at the consummation, thus denying premillennialism. As an Amillennialist, though, he doesn't seem too pessimistic. For example, he claims that "By living in obedience to Christ, his disciples participate in the establishment of God's kingdom on earth. This kingdom is not restricted to national boundaries, but is gradually expanding to fill the whole earth. Yet as this divine kingdom continues to grow, with more and more people acknowledging the supreme sovereignty of God, many of the earth's inhabitants defiantly refuse to enthrone God as Lord" (96). Yet, while this brief detour indicating millennial affinities is worthwhile (as are many other ones), Alexander takes some weird detours too. For example, he spends three pages taking some shots at capitalism. While I agree with the basics of his discussion here, he seems to simply rest on anti-capitalist caricatures of capitalism. He engages in the common mistake of confusing capitalism with capitalists. He also falls for the fallacy that the "rich" and the "poor" and the world's "wealth" are static categories and the "rich" have a large portion of the "total wealth" while the poor are left fighting over the scraps. These categories are not static. Furthermore, "wealth" isn't a static pie that is cut up into pieces. In fact, capitalism (broadly, though I understand some forms of capitalism are not capitalist) is the cause of building wealth so that the world is moving upward in a linear fashion in terms of things like wealth and life expectancy (go to gapminder.org and click play on the graph). He also confuses self-interest with greed, taking his understanding of capitalism more from Gordon Gekko than a Hayek, a Friedman, a Sowell, a Mankiw, a Richards etc., though I realize these thinkers have their deficiencies). I felt this digression was unhelpful and would have rather the three pages been spent elucidating his main points some more. Anyway, I guess I shouldn't be too hard, Alexander is a theologian and not an economist, after all. All in all, this was a very good book. It inspires as well as well as illuminates by looking at some of the great biblical themes Christians love. Alexander shows a tight unity pervading the Bible and shows how all the themes have their fulfillment in Christ and their end in the arboreal temple-city of the New Jerusalem. Great biblical theology but the application of the use of the USA and capitalism was odd. As a missionary it bothers me when non citizens make judgements about a foreign country's culture and politics. I have seen this happen with Americans making erroneous judgements about other cultures. This is the first time I have seen it happen towards my own culture. It was interesting to read. Reading this book for Biblical Hermeneutics class. It provides a lot of insight into how the whole Bible has a meta-story that connects books in both testaments at different times by different authors. Definitely something I recommend reading to any seminary student. This exceptional and succinct little book is among the best I have ever read. Such a wonderful look at God’s plan through the pages of Scripture to bring His broken creation back to it’s original eden-temple ideal (and beyond) - where God and man dwell face to face. Glad I finally got to read this book. Short, engaging, helpful. Fantastic. Helpful and very transformative. Will be re-reading multiple times in the future. Very intellectually and academically written. Everybody should have this book in their library. How does God establish his sovereignty over creation? Or his victory over evil? Or a blessed, eternal life for his people in the New Jerusalem? These are the kinds of story lines that are essential to understanding and finding hope in the Bible, and T. Desmond Alexander introduces them well in his book, “From Eden to the New Jerusalem.” His treatment is deep and wide and succinct—not an easy thing to do! I would consider this an academic introduction perfect for church elders, first-year seminari How does God establish his sovereignty over creation? Or his victory over evil? Or a blessed, eternal life for his people in the New Jerusalem? These are the kinds of story lines that are essential to understanding and finding hope in the Bible, and T. Desmond Alexander introduces them well in his book, “From Eden to the New Jerusalem.” His treatment is deep and wide and succinct—not an easy thing to do! This book is fantastic. This is an excellent introduction to Biblical theology and should be required reading for seminary students. Others will enjoy it as well, although it is not written for a lay audience and so it might seem a little academic. Alexander includes large biblical quotations in the text, which I really appreciated since I didn't have to either take his word, or go look up the passage myself. It is always good to get the Bible in front of us. He covers the whole sweep of the Bible This book is fantastic. This is an excellent introduction to Biblical theology and should be required reading for seminary students. Others will enjoy it as well, although it is not written for a lay audience and so it might seem a little academic. He covers the whole sweep of the Bible while looking at a number of different topics and themes. Genesis 1–3 and Revelation 20–22 play a big role, but he deals with many other passages as well. He demonstrates a solid grasp of the scholarship as well, which enriches his work without making it too academic. I have found many books on Biblical Theology to be full of good information, but too long and, frankly, off-topic. Not so with Alexander's book. The author does in 200 pages what most do in 400. The first quarter of the book is worth the price of the whole. In the first two sections Alexander establishes that God created to earth to co-exist with people. After the Fall, man enjoys fellowship with God through the presence of the tabernacle, temple, Incarnation, Holy Spirit and, of course, in the I have found many books on Biblical Theology to be full of good information, but too long and, frankly, off-topic. Not so with Alexander's book. The author does in 200 pages what most do in 400. The first quarter of the book is worth the price of the whole. In the first two sections Alexander establishes that God created to earth to co-exist with people. After the Fall, man enjoys fellowship with God through the presence of the tabernacle, temple, Incarnation, Holy Spirit and, of course, in the New Jerusalem. In the past, I have been critical of some of Alexander's work. * However, I am always thoroughly challenged when I read him. Those looking for the meta-story of the Bible will be aided and encouraged by this book. T. Desmond Alexander (PhD, The Queen’s University, Belfast) is senior lecturer in biblical studies and director of postgraduate studies at Union Theological College in Belfast, Ireland. He is the coeditor of the New Dictionary of Biblical Theology.